Lamu Kenya has a wide variety of hotels and vacation rentals (holiday homes, cottages and villas) offering high quality accommodation. They ranges from luxury to budget. Here you will find some of the best Lamu hotels and vacation rentals. 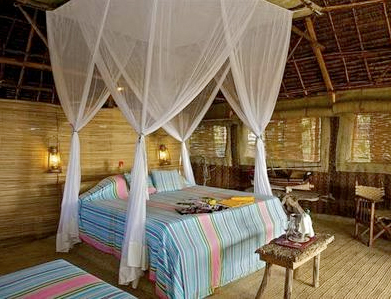 You’ll also be able to search hotels in Lamu for the best price and availability and book online. It is the only hotel situated directly on Shela Beach. Peponi Hotel is a small, private, family-owned hotel, which was once a house. It has a tranquil atmosphere and offers a total of 24 rooms that are categorized into superior and standard rooms. The hotel is closed from May 1st to June 30th. Kipungani Explorer is the perfect destination for those seeking a true desert island vacation. It is situated on the southwestern tip of Lamu Island and offers all the aspects of coastal relaxation – sunbathing, water sports, classic cuisine and 12 kilometers of pristine sandy beach. The hotel is closed from April 1st to June 30th. It is situated in Shela village, which is 15-minute boat ride from Lamu. The hotel offers a complete view of the whole village and a clear scenery of the Indian Ocean and other islands. Msafini Hotel has spacious guest rooms, a swimming pool, a balcony on every room, sea views, a relaxing rooftop lounge and great food. It is situated in the heart of Lamu Old Town. The hotel offers 17 tastefully furnished rooms, 5 terraces, an ‘a la carte’ restaurant and a small salt-water pool in an interior courtyard with a bar. The house is built on three floors around an open courtyard, 2-minute walk away from Shela Beach. It is ideal for a family or group who are seeking a tranquil and private place. Shela House can accommodate 9 people or 2 families. It has 5 ensuite bedrooms – 3 double, another with 2 large 4-poster single beds and a smaller single bedroom. The house stands right on the edge of the Indian Ocean on a two-acre garden. It is ideal for couples, group of friends, family reunion or a romantic hideaway. Jahazi House has 4 bedrooms well furnished with private verandas, fans, en-suite shower rooms and mosquito nets. It also has a fully-equipped separate kitchen and a swimming pool. Situated directly on Shela Beach, the house has a magnificent fresh water swimming pool. It can accommodate 12 -14 people, has four double rooms and one dormitory style quadruple, all ensuite, with spectacular sea views. It is situated behind Peponi Hotel, just a couple of minutes from Shela Beach. Mnarani House offers spectacular sea views from the first and second floor. It can accommodate 6 – 8 people in its 3 double bedrooms all ensuite upstairs, 1 small double ensuite on the ground floor and 1 ‘open’ single room without bathroom upstairs. Use the search below to search Lamu hotels and vacation rentals for the best price and availability. Lamu has many attractions, which make it an excellent holiday destination. You can choose to go for a vacation package or have a tour company tailor your tour according to your requirements. Here are some Lamu vacation packages. Lamu is served by up to four scheduled flights a day from Nairobi (the capital of Kenya). Flights take just over an hour. There regular flights to and from Mombasa and Malindi. Flights arrive at an airport on neighboring Manda Island, from where it is just a few minutes boat ride to Lamu.